Ugh. I was having such a great day, and then I started sneezing and my nose started dripping, and my throat started getting sore…. Phooey. I am just barely recovered from the last cold, and now I’ve got another one. Sure makes it hard to want to do anything but crawl under the covers. It’s really tempting to just go to bed, and not bother posting, but I’m afraid to take a day off — if I take one day off, it might extend to 2, and then pretty soon it’ll be 6 months later and nothing will have been posted. I’m working on a small quilt for a challenge (the only "rule" for this challenge is that the quilt is supposed to be odd-shaped…). I’m really happy with how it is turning out. I’m very proud of myself for picking an idea, and just running with it. Which, really, is the whole point of the challenge — to get it done within a week. I’m at a point with it, though, where I’m starting to agonize over how to embellish it. How much is too much? Or really, how much is actually enough….I need to get some quilting for customers done tomorrow, so my challenge piece will probably get stuck up on the design wall for me to ponder. 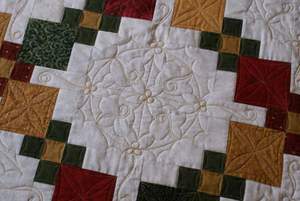 Here’s one of the detail shots of the motif I quilted. I used Superior Gold Metallic thread to do all of the stitching. On the white fabric, I actually stitched all of the lines twice, as a single stitch just didn’t show up well enough. You don’t suppose I liked it because the jacket on the right is RED wool, do you? 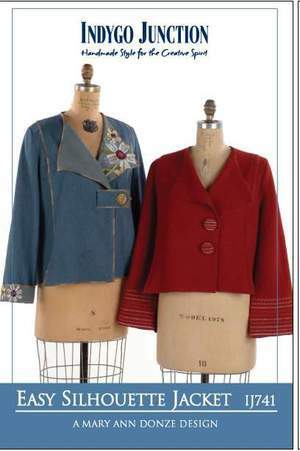 The jacket is not lined or faced, and the collar is actually the reverse of the fabric. I didn’t quite realize this when I bought it, and of course, I don’t really have any fabric that’s appropriate. Yet…..
Oh — one more thing….I did mean to work on the book today, but darn it, I’m going to bed, so I’ll do it tomorrow…..